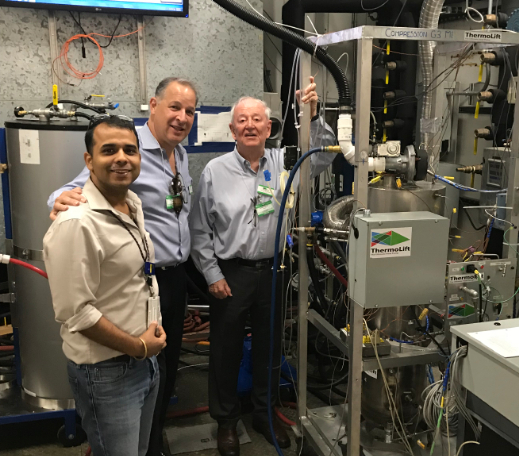 Stony Brook, NY; November 12th, 2018 – ThermoLift is pleased to announce the completion of successful testing of its innovative, refrigerant-free natural gas air conditioner and cold-climate heat pump technology at Oak Ridge National Laboratory (ORNL). This testing, completed as part of a Department of Energy funded grant, demonstrates the system’s ability to simultaneously provide heating, cooling and hot-water with a single device as well as its capability to operate at cryogenic temperatures to provide a full range of HVAC functions using only natural gas as its fuel. "ThermoLift’s thermally-driven heat pump can utilize the abundant domestic resources of natural gas to provide both heating and cooling in an environmentally friendly and cost-efficient manner” said Robert Catell, former Chairman of National Grid. 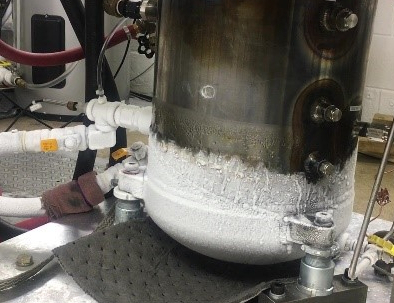 ORNL testing focused on validating ThermoLift’s high heating performance. This testing demonstrated that ThermoLift's cycle coefficient of performance (COP) exceeded all the DOE designated temperature targets for cold-climate heat pumps based on the international ANSI/AHRI/ASHRAE ISO Testing and Performance Standard. The company demonstrated high performance exceeding targets at the most difficult test point, namely operating temperature of -25˚C with a COP of 1.31. ThermoLift COP performance as tested at ORNL compared to DOE targets. “Uniquely, the ThermoLift system can maintain high performance and energy efficiency across these temperature ranges, when other systems require a secondary back-up device”, said company President and co-founder Dr. Peter Hofbauer. HVAC represents approximately 70% of energy consumed in cold climates and on average, 45% of the total energy consumed in residential and commercial buildings nationally. ThermoLift has the potential to reduce this number by 30-50%, compared to the installed base as well as state of the art equipment. This system can deliver a large energy cost reduction to the person paying the energy bills. ThermoLift’s technology reduces acquisition cost (buying one system instead of three) with a smaller equipment footprint. Market potential for ThermoLift extends beyond commercial and residential buildings to industrial applications including refrigeration, food processing, pharmaceutical manufacture, cryogenics, LNG, and desalination. About ThermoLift: Founded in 2012, ThermoLift (http://tm-lift.com) is headquartered at the Advanced Energy Research and Technology Center in Stony Brook and receives business development support from the Clean Energy Business Incubator Program (CEBIP) at Stony Brook University. Recently, ThermoLift released its Gen 3.0 Testing Video that highlights some of its innovations and technological advances. About ORNL: Oak Ridge National Laboratory (www.ornl.gov) is the largest US Department of Energy science and energy laboratory, conducting basic and applied research to deliver transformative solutions to compelling problems in energy and security. Its annual budget is $1.65 billion.